John Hussman had some interesting comments on Fannie Mae's last earnings statement in Nervous Bunny. With regard to Fannie Mae's report, the most interesting figure wasn't the reported $2.3 billion loss, but rather the much larger deterioration in the reported fair value of Fannie's balance sheet. We can observe what's going on by comparing Table 32 of Fannie Mae's Q2 2008 10Q filing with the same table in Fannie Mae's Q1 2008 10Q filing. As of June 30, 2008, the fair value of Fannie Mae's common equity (that is, the book value available to common shareholders) was -$5.39 billion, compared with a March 31 fair value of -$2.07 billion. What's notable here is that this deterioration (-$3.32 billion) was even larger than the -$2.30 billion loss that Fannie reported to investors, which was itself about four times higher than the loss analysts had estimated. Note that balance sheet losses are excluded from earnings. Financial stocks tend to be reasonably valued when they trade at tangible book value, but simply put, Fannie Mae has no tangible book value. The common stock is now a call option. Even if we include the fair value of preferred equity, we find that on a fair value basis, Fannie Mae is operating at a gross leverage multiple of 72.7 (total assets comprised primarily of mortgage loans, divided by shareholder equity). In other words, a slight 1.4% deterioration in the value of Fannie's book of assets will wipe out all of the remaining shareholder equity. This makes Long Term Capital Management look like a conservative strategy. Minyanville Professor Bennett Sedacca was also talking about Fannie Mae and Freddie Mac options in a A Tale of Two Markets, Part 1. Freddie was supposed to raise $5.5 billion according to its earnings announcement back in June 2008. The problem is that it decided to wait for a better time in the market to raise this capital. 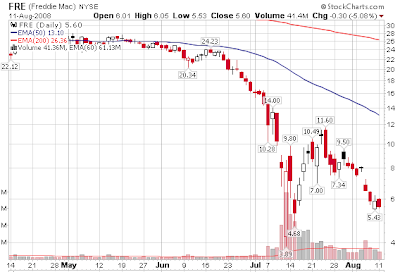 However, in the meantime, its common stock price plummeted from $25 at the time of their announcement to a recent $5. While they only have 750 million shares outstanding, issuing 1.5 billion new shares really wasn’t an option as this would dilute the current shareholders beyond recognition. The Treasury would issue a ‘super-senior’ preferred stock offering that gives them effective control of Fannie and Freddie. At the same time, though, the equity shareholders who have ridden the stocks down 95% will get little if anything. I would also imagine (and the market seems to be pricing this in now) that the dividends on the $50 billion or so of outstanding preferred shares (mostly owned by institutional investors) will be suspended. Keep in mind that these issues are non-cumulative, non-mandatory preferred shares. This means that if/when they stop paying dividends, they don’t get to accrue future dividends, they just simply resume at some point in the future if this all works out. So what is the value of a preferred equity that doesn’t pay a dividend...? Very little. Effectively what you own is an option on a future uncertain stream of dividend income that may start again in the future. While I am fairly confident my view will play out, I openly wonder if this model won’t be used for other troubled institutions (like overleveraged financial concerns like Lehman (LEH), Merrill (MER), Citigroup (C) and AIG). They are important to the system as well. The Fed and Treasury know this, of course, and the while many important entities will probably be saved, there may be many others that are too small to care about and so poorly run that no one wants them -- you can throw National City (NCC), Zions (ZION), Regions Financial (RF), KeyCorp (KEY), into this category -- not to mention countless privately controlled community banks. Paulson and the SEC acted to initiate a short squeeze in Fannie Mae, Freddie Mac and financial in general. Please see Panic By The Fed: Anatomy of a Short-Squeeze and Selective Enforcement of Regulation SHO for more details. The squeeze "worked" until the juice dried up. Fannie rose from $6.68 to $18.48 in one week flat. In two weeks flat it was back at $8.40. 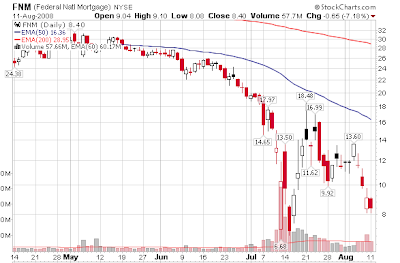 Freddie Mac rose from $3.89 to $11.60 only to fall back to $5.43. Now it appears that the common stock of both is likely to drift towards zero, especially if the situation plays out as describe above by professor Sedacca. One of the purposes of of Paulson's and the SEC's manipulation was to force the price of Fannie and Freddie up so that new capital can be raised. The above charts show the manipulation failed spectacularly. Yes, some financials held their gains but some like Washington Mutual (WM) did not. Did the squeeze partially work then? The answer is no, not really. As we have seen many times in the past, every time sentiment gets extremely bearish there is a rally. Sentiment against financials was nearly off the scale a few weeks ago. What Paulson and the SEC did was goose the initial bounce, no more, no less, and it appeared to "work" only because financials were poised to rally anyway. Careful scrutiny will show that financials, like the dollar, rallied because they were damn good and ready to rally. For more on this idea, please see Currency Intervention And Other Conspiracies. Sadly, many otherwise extremely bright people make the mistake of equating correlation with causation, time and time again. Sadder still is some of the acrimonious debate over this point. But the fact of the matter is the dollar was poised to rally. Sentiment was as bearish as I have seen it in spite of the fact that fundamentals on the dollar (expected movements in interest rate differentials, declining oil, and improving balance of trade prospects) were rapidly changing for the better. So along comes a minuscule (to the forex markets) intervention, and it was supposed to have caused this dollar rally. Sorry folks, it did not cause a damn thing. If the dollar was not poised to rally, intervention would have failed as it did 13 consecutive times before that. Still another chart shows that over $300 billion in currency intervention by Japan did no good. The key point is that intervention does not work although at times it may appear to work. And this is what leads otherwise bright people to confuse correlation with causation. In the micro-sense, if one is trading very short timeframes, then I suppose from that perspective these manipulations could have meaning. In longer timeframes, attempts to manipulate the market fail every time. China put curbs on shorting stocks. The Shanghai index fell 52% anyway. The TAF, the TSLF, and the PDCF were all supposed to prevent a collapse like we saw with Bear Stearns. Bear Stearns collapsed anyway. And I cannot count the number of times in this downturn that people blamed the PPT for propping up homebuilders, or Ambac (ABK) or MBIA (MBI). If the PPT was acting, it sure failed miserably. Ambac fell to as low as $1.04. So why did Ambac rally? Ambac rallied because pessimism was excessive, Ambac had enough cash to survive for at least a while, and for some, a $1-$3 share price was tantamount to being a rather cheap call option on the possibility it surviced longer. For others, shorts have to cover sometime anyway. Why not start at $1-$3? So if you think manipulations caused, the rally in Amback (or any other financial) to stick then you are not thinking clearly. Yes, the Fed, and the SEC, and the Treasury have been openly intervening. Yet, there is no evidence if one looks closely (avoiding the trap of equating correlation with causation), that any of this manipulation caused anything other than a small blip on a screen in a very short timeframe.